Sing Out, Louise: LGBTQ Resisters Say Vote! [VIDEO] - Joe.My.God. Sing Out, Louise! 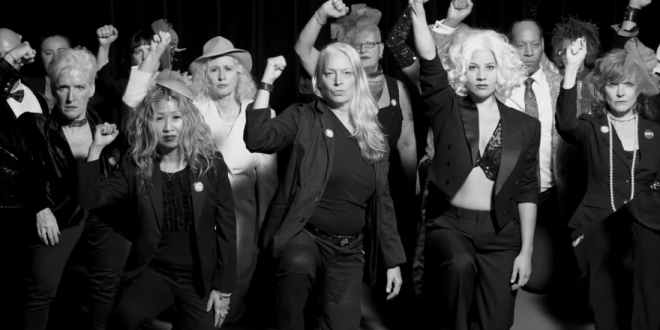 an LGBTQ+ singing collective made up of activists from Gays Against Guns, the Women’s March, Rise and Resist, and Moms Demand Action, is pleased to release its first music video, Vote, in the run-up to the fall midterm elections. Instead of Hollywood stars, Sing Out, Louise! raps about its favorite progressive leaders. Escapism isn’t the message, voting is. Sing Out, Louise! has been leading protesters in songs “in the key of F you” for almost two years, belting out a songbook of retooled American standards, holiday carols, show tunes, and pop tracks. Sing Out, Louise! has been in the streets almost without stop since Trump was elected, performing at marches, rallies, and actions. On October 6 the resistance group was honored to appear at the Kremlin Annex, the nightly protest at the White House. I know a few of these folks!